Discussions Magazine Music Blog: JIMMY BUFFETT/Somgs From St. Somewhere: the NEW album available August 20th, 2013! 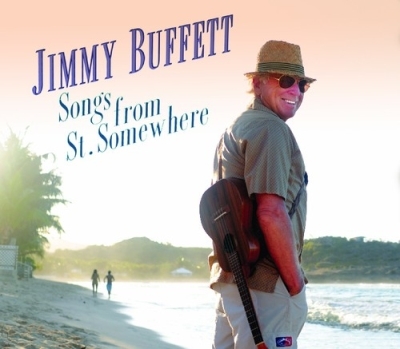 JIMMY BUFFETT/Somgs From St. Somewhere: the NEW album available August 20th, 2013! 2013 album from the veteran singer/songwriter. Songs From St. Somewhere features 15 brand new recordings plus a bonus track. The album was recorded in the spring of 2013 in various locals including Key West, Nashville, Austin, Miami and St. Barts. The first single, 'Too Drunk To Karaoke', is a duet with Toby Keith. Other songs on the album include 'Somethin', 'Bout A Boat', 'Einstein Was A Surfer', 'Tides', 'Useless But Important Information' and let's not forget the bonus track, 'I Want To Go Back To Cartagena', a Spanish version duet with the Latin singer Fannie Lu.